The first hidden motive that Robin Hanson revealed in his Ted Talk on his book, The Elephant in the Brain: Hidden Motives in Everyday Life, comes from a situation that most of us would not consider part of our everyday lives: a psychologist in a lab experimenting on a split-brain patient. As the name implies, these are people whose brains have been split down the middle so that the left and right sides have no contact with each other. The experiment is to instruct the right side of the brain to stand up and then ask the left side why he just stood up.1 The honest answer would be “I don’t know” because the left side doesn’t know that the right side was instructed to stand up. Instead, the left side lies, not just to the psychologist (which could be forgiven as a funny joke since the guy is playing with his disability) but to himself. Rather than painfully admit that his action had no thoughtful motive the patient instantaneously comes up with one and then (since it’s not a lie if you believe it) he convinces himself that it was the reason he stood up all along. “I’m going to get a coke”, he says sincerely. This behavior is not unique to split-brain patients. Everyone does it and the proof is everywhere. Take a child’s soccer game. Parents tell themselves that they go to their kids’ soccer games because they love their kids and want to support them in everything they do. They do not tell themselves that they go because they don’t want to be shamed by the other parents. In reality, both of these reasons are probably true. After all, the best lies are only half lies. A split-brain patient will come up with some other reason why he just stood up if, in that moment, he wouldn’t enjoy a coke. And parents really do love their kids and want to support them. If they had all the time in the world they probably would go to every soccer game. So it’s not that much of a stretch to convince themselves that they are going to the game, even though they’ve got a huge work deadline coming up because they just love their kid that much rather than because they want to prove to Shannon that they love their kid that much. 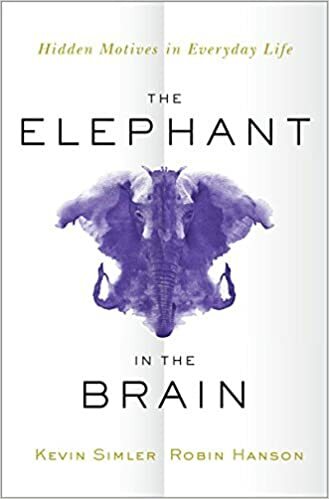 In The Elephant in the Brain: Hidden Motives in Everyday Life, Robin Hanson and Kevin Simler convince us that hidden motives control who we vote for, who we marry, which school we go to, if we go to school, basically everything we do. They are the elephants in our brains that none of us want to take a good long look at. When Hanson first started writing his postdoc on healthcare policy, he wasn’t looking at the elephant; he was just watching his own feet. But after repeatedly walking smack straight into the elephant while trying to get to an effective healthcare system he was forced to look up and acknowledge what was right in front him; people don’t just go the hospital to get healthy, they go for a sense of belonging and importance. The proof is in medical history. For most of human history doctors or healers or whatever term applied had no idea how to make someone healthier and yet they existed and people went to them and revered them in cultures all across the world, all across time. Despite not serving an important medical role, they served an important psychological role. People need to feel that someone important cares about them especially when they’re weak. Nowadays doctors serve both functions, legitimate medical professional and spiritual healer, and the two roles don’t always lead them down the same path. Oftentimes, there is nothing doctors can do for patients with certain types of late-stage cancer, except advice them not do anything that could make them ineligible for a clinical trial. But instead, some doctors choose to put these patients on chemotherapy, which incidentally does make them ineligible for a clinical trial, because patients are comforted by the action, much in the same way syphilis patients were comforted when prescribed a dose of mercury. Reading The Elephant in the Brain’s sections on healthcare sheds new light on Milton Friedman’s Capitalism and Freedom’s section on the same topic. Friedman suggests that we make America healthier by abolishing the medical licensure system. Then we could better stratify healthcare and make it more affordable. Every time you go to the doctor, no matter the reason, you have to pay for the eight years of schooling and three to seven years of training she had to go through and pay for before she could put the letters MD after her name. But it doesn’t take twelve years to learn how to fix a broken arm or recognize flu symptoms, the everyday things that usually bring us to the doctor. Our everyday medical costs would plummet if we could see a medical technician with a year or two of training for the things that only take a year or two of training to do. This is Economics 101, when the cost of production goes down supply goes up and the price goes down, and Milton Friedman suggested it in 1962, over half a century ago. So why has absolutely nothing come of this sure fire way to give the people what they say they want, affordable healthcare? Because of the elephant. The spiritual healers who society reveres and whose attention to our wellbeing brings us comfort are not technicians. They aren’t commonplace. We want healthcare to be affordable but we don’t want it to be cheap. I’ll admit when I first read Friedman’s idea I instinctively didn’t like it. So I started coming up with reasons to justify disliking it. As I read on, Friedman addressed and dismissed every one of these reasons and I still didn’t like it. I was staring at my feet trying to walk towards Friedman as he called out to me on the other side room where the door was but I just kept hitting the elephant. Fifty-two years after Friedman found the door to affordable (or at least more affordable) healthcare and started calling us towards it, we haven’t walked through the elephant. So what’s the solution? Well, the obvious one is to look up. Not once in Capitalism and Freedom did Friedman address the fact that healthcare is sacred to us. Had he done so, I might have better understood why I instinctively disliked his idea and it would have been much easier for me to reason that seeing doctors with a twelve-year degree makes us feel good but that’s not nearly as important as getting real medical care to everyone. Acknowledging the elephant means you can walk around it. But acknowledging the elephant isn’t always easy and it isn’t always good, as Robin Hanson and Kevin Simler admit. Like they say, there is a hidden motive for why we do almost everything and we hide them for a reason. If the real reason why you’re inviting your neighbor to dinner is that he helped you change your tire and not because you like him, it won’t do any good to tell him that. And if you hide the motive from yourself and convince yourself that you really want him there, you’ll probably have a better time at dinner. Sometimes the elephant isn’t really in the way. But even when it is, if the stated motive is sacred, you may not get anywhere by telling people to look at the elephant. Author Sam Harris hasn’t gotten anywhere by telling Christians that they’re Christians not because they believe in fundamental Christian principles but because they enjoy a sense of belonging. He’s just earned himself a reputation for being obnoxious. So if you want parents to better allocate their time and make it easier for them (and especially for moms) to work, you might have to guide them around the elephant while they stare at their feet. Instead of having games throughout the year, schools should host one big tournament at the end of the season so that parents only have to clear their schedule for one weekend. Before the tournament, you can host practice games, so the kids get the same amount of playtime but parents aren’t encouraged to attend. A policymaker who’s trying to implement Friedman’s idea might also benefit from this approach. Rather than pitching Friedman’s idea, she might first pitch an idea that’s to the side of the elephant. We’re not going to abolish medical licensure we’re just going to create a new license for people who fix broken bones. And we’re not going to call them “technicians” we’re going to call them “highly specialized medical practitioners,” who still need to get a special degree, just not one that takes twelve years to get. Policy makers at any level, from school program designers to the President, should try to find the elephant in every issue they address so that they can point it out to others or guide them around it. People trying to reform higher education need to acknowledge that college isn’t really about spreading the wealth of knowledge. We go to college to prove that we can learn, adapt, and, significantly, jump through bureaucratic hoops better than the people who haven’t gone to college. People on both sides get a lot of moral satisfaction and a sense of belonging out of refusing to compromise on gun control. Should policymakers point this out to them or should they focus on violence reduction methods that have nothing to do with guns like putting up more streetlamps? In the end, Robin Hanson and Kevin Simler’s message is simple; someone has to look at the elephant because no one is ever going to be able to walk through it.